Everyday we diligently work in the field to provide our customers with up to date and accurate information about tree health and their natural characteristics. In this urban environment, we as people also bring in our own factors that influence the life and health of our trees. Most of those factors involve construction and spacing, which can either be helpful or detrimental to tree health depending on how they are applied. Our goal is to help educate those that have the desire to ensure that their trees thrive in this arid desert climate. Recently we have decided to incorporate this effort of tree preservation on our website. We will be posting helpful information on our blog through out the year that is relevant to the season, and specific to the tree species. We use only the most credible sources, such as the International Society of Arboriculture and the Colorado State University website. Our other most valuable resource is experience; Fifteen years of observations and training in the field that have lead to discoveries that have not yet been printed in books or published online. We have a slogan at Advanced Tree Service, LLC. But it is not just something we say or that we had a marketing consultant come up with. It is a statement and a promise that we live out everyday. We are a company founded on tradition, dedicated to conservation, and committed to excellence. We hope you find our information helpful in your quest to keep your trees vibrant and hardy. There are many factors to consider before planting trees. Often these factors are ignored and the problems that can occur can be quite expensive. It pays to take time in considering what type of tree to plant and where to plant it. Researching a specific species and its characteristics will help determine whether or not it is properly suited for the space and environment that is present on your property. Visiting a nursery to select a tree is also very helpful and the staff working there are usually very knowledgeable on this subject. Once presented with your specific needs, they can usually narrow down the search of a suitable choice. One of the biggest things to consider before buying a tree or shrub is the space available for the tree to grow in. If the space is limited, a tree with a much slower growth rate is usually a preferred choice. The growth rate is a measurement of how much a tree will grow in one year. If space is extremely limited, a shrub may be a better choice. If you are set on getting a specific tree, you may have to choose a different location to plant it and allow it to grow without being hindered or causing damage to surrounding plant life and structures that may exist. Damage to existing structures such as driveways, sidewalks, or even the foundation of your home may occur if trees are planted to close. Tree roots are often the culprit and they have no problem cracking a driveway or sidewalk. They can also work their way into sewer and water lines causing thousands of dollars in damage. The city will expect the home owner to pay up and fix these lines. It is absolutely critical to request an underground “Locate” before choosing a location and digging. Almost every yard has a vast system of pipes and wires underground. This is a free service offered by local utility companies and the phone number is 811. Two other important factors in choosing a tree are the conditions of the soil and the available water that the tree will have. We often face drought conditions and trees with a high growth rate will need a steady supply of water and nutrients to survive. Also, if the soil lacks rich nutrients, fertilization will need to be done on a semi-annual basis to help the tree as well. Certain trees such as pines and spruces often continue to thrive through periods of drought. Large old growth Cottonwoods will often die off if subjected to the same conditions. Watering on a regular basis can get expensive. It is best to make sure you apply water correctly or it may be wasted. The smaller fibrous roots that absorb water are near the drip line of a tree. The drip line is near the edge of the branch tips. Roots usually grow to the edge of the drip line. That is where watering will have the greatest affect. Watering slowly over time with the use of a soak-er hose or drip system will also prevent run off. The good thing is there are endless options when choosing a tree. If you hit a road block, there are always many other choices out there. You may even find something better than what you had first considered to be a perfect match. Trees are very unique in many ways and can dramatically enhance the beauty of the landscape around your home. They also add value to your property and curb appeal. Our goal at Advanced Tree Service is to help our customers make the best educated decision so that their trees can thrive without breaking the bank.. and the sidewalk. As a licensed tree service, tree removal is one of the most dangerous jobs that we take on in the Colorado Springs area. Our customers often comment that we make it look easy, but it is definitely not an easy task. Taking down a sixty foot tree that weighs over two tons with houses, fences, and wires all around can be a challenge for the mind and the body. We first started removing storm damaged trees in 1998 after an ice storm hit the east coast. Since then we have seen and worked in just about every situation imaginable: trees on top of other trees, houses, power lines, vehicles, and trees on fire. We call these hazard trees and the possibility of death in these situations can be a bit overwhelming. It takes a heightened sense of awareness, and nerves of steel to handle these jobs safely; especially when it’s raining, windy, and dark outside. Over fifteen years of experience has taught us that every precaution must be taken to avoid injuries and damage to property on a tree removal job. An arborist must expect the unexpected. It only takes a second to make a mistake and there is no going back. If the tree is unstable due to wind damage, rot, or soil erosion, the risks expand exponentially. Every possible outcome must be considered before we can even start the job. A lengthy inspection of the tree and the surrounding structures must be taken into consideration. The entire crew has to be made aware of all the possible risks for an accident. Identifying the high risk areas of the tree removal job before commencing work helps us prevent unnecessary damage and injuries. Due the high numbers of deaths and injuries involved in tree care, we urge you to consider the possibilities when hiring a tree service to remove or trim your trees. If you just look at the price when making this decision, you may be headed for trouble. Extensive experience in the field is critical as well as a good safety record. A contractor should be concerned and aware of the risks. A proactive approach with safety as the number one goal should result in a job well done. At Advanced Tree Service, LLC, we demand that our workers follow all OSHA and ISA guidelines for a safe work environment. Proper training is essential followed up with examples of actual accidents and statistics. We encourage them to take breaks as needed, especially in the summer heat. We stress the importance of rest and nutrition to them. Alcohol and drug use is strictly forbidden. This is our rule: safety is not something that we can compromise for any reason. We can’t stress enough how important proper fire mitigation is at this time. We’ve all seen and experienced the devastating effects wildfires can have on our community. We work diligently with our customers to create a fire safe landscape while preserving as much of the natural habitat as possible. When assessing the risks around your property there are many mitigation factors to consider. Trees and brush around the property are usually the first things to come into consideration. It is recommended to maintain a fifteen foot barrier between structures and trees or shrubs. It is absolutely critical to keep this barrier free of debris and fuels such as leaves, pine needles, dead branches, and pine cones. Lower tree branches may need to be removed and the surrounding brush thinned to reduce the ladder affect which allows flames to climb into the crown of the tree. It is fire wise to keep your entire property clean and free of accumulating dry tinder or debris, especially in your gutters or under your deck. Do not stack firewood next to your house. Another important factor in considering fire risks is construction materials. Certain materials used in home construction can be highly flammable. Old cedar shake roofs, log homes, vinyl siding, and wood that is coated with polyurethane have a much greater risk of burning than stucco or stone. If you have a home built with high risk materials, you may want to double or triple the size of the defensible zone around your home. In doing so, you greatly increase the chances that firefighters will be able to save your home during a wildfire. Before making any drastic decisions, it is best to get educated and request one or more professional assessments. There is a vast amount of useful information on the Colorado Springs city website and on the Colorado State University website as well. You can request a free assessment through the FIRE-WISE office and from local tree services. It is best to get involved with your neighbors and encourage them to be proactive as well. As far as our record is concerned, we have spent years helping our customers to meet or exceed the guidelines set in place by insurance companies and the fire department. 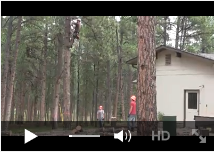 One thing that sets us apart from other tree services is that we guarantee our work. We take every measure to make sure your property will pass any inspection. Our work has never failed an inspection, but if it does not pass, we will promptly come back and correct the issue at no additional cost to the customer. We get a lot of concerned customers that see dead limbs in their tree and wonder if the tree is in decline. This is often not the case. Dead limbs occur naturally in most trees over time. Some dead limbs through out the tree is not a huge cause for concern but there are a few indicators that may be a sign of bigger problems. When the crown or top of the tree is dying off it usually works its way down the whole tree. This is something no homeowner wants to see. Also, when large sections of the tree are showing decay or die back, this can be a cause for concern. If large cracks are visible where the branch connects to the trunk, this branch or lead is weak and may topple over at some point. If you hear popping or cracking sounds from the tree when the winds are gusting, you should definitely have the tree inspected by a professional right away. Pine trees call for a bit different approach. Pines that are dying off at the top are definitely in trouble. But because of the various beetles that invade pines, you still need to closely watch for die off through out the tree. Some branches may die off and parts of the bark fall off revealing the dreaded beetle trail. Small grooves are visible across the limb where the beetle has tunneled its way through. Also, small pin holes will be visible. This is often difficult to see from the ground and will require a closer inspection. Another indicator is pitch or sap leaking from the trunk; This is a natural defense mechanism for pines. Any section of the tree that has signs of beetle infestation needs to be removed as soon as possible. In any case, the need for further inspection by a professional is the best course of action. Also, the removal of dead limbs does improve the over all health of the tree. Trees that show decline may just need more water and or fertilization. The sooner you address these issues, the odds are that the tree will not only survive, but it will thrive for years to come. Save the pines!!! As soon as you notice a pine on your property that is dying off…have it inspected and possibly removed from your property. The mountain pine bark beetle and the engraver beetle have already left massive scars across the Colorado landscape. We have already encountered cases of the engraver beetle in Colorado Springs. If caught early enough, the affected areas can be trimmed out with the hopes of saving the tree. If the tree has died off completely, the insects will move on to another living tree that is already stressed. They will continue this process over and over again. Here’s what to look for: the crown or top of the tree is dying off, large accumulations of sap on the trunk. Here’s what to listen for: woodpeckers-they are a tell tale sign that insects are in the tree. Some preventative measures are watering and fertilizing the tree to ensure its health. Tree spraying by a professional also helps keep the bugs away. It’s always hard to lose a tree, but if you are proactive, you might just save the forest around you. Give us a call and we will provide a free assessment and estimate if work is needed. Spring is fastly approaching..Time to trim up those fruit trees. Low temperatures are keeping fire blight dormant as well as insects that may transfer the fungus. Fire Blight is known for devastating fruit trees and it is identified by the burnt look it creates on limbs. The other benefit of trimming in early spring- the tree has all season to heal and produce regrowth. Keeping your fruit trees maintained will also produce a better quality of fruit and it will help prevent breakage of limbs that cannot support the weight of its own fruit production. Not sure whether or not your fruit tree needs pruning? In these extremely dry conditions, absolutely! We have had little to no precipitation this winter and it will definitely stress the trees. Watering and fertilization are the front line defense to protecting the health of our trees. After this extended lack of moisture, you may end up seeing increased numbers of dead limbs this spring. Most trees are dormant this time of year, but that doesn’t mean they can live without moisture. And since they are not getting much help from Mother Nature, you may want to pitch in to help ensure the sustained health of your trees. It really doesn’t require too much effort either. I usually recommend watering in the evening, but due to the colder temps at night, mid day might be the best time. If you’re going to hook up the hose, just make sure you unhook and drain it afterwards, or it will be frozen solid the next day and it may freeze your pipe as well. Some folks would rather use a bucket or watering can and that is fine too. Just try to apply the water as slow as possible. Rapidly dumping water will result in a large amount of run off and little amounts of water will actually reach the tree roots. As long as there is no snow, I recommend watering once or twice a week when the temperatures are well above freezing. And remember, the larger the tree is, the more water and nutrients it will need to thrive. Normally you would not need to do this in winter, but the affects of drought and weather patterns often leave us with no other choice.